Nominated for a Jack Richardson London Music Award, 2017! 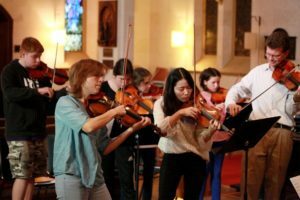 The Rebelheart Collective at the Aeolian offers our community a conductor-less orchestral ensemble focused on collaboration, community and apprenticeship opportunities. It is dedicated to transforming the concert experience. Its core of musicians are highly trained professionals who believe in giving back to community and helping train our next generation of musicians. Its co-operative model ensures that its members are involved in all elements of planning, teaching, marketing and administrative facets. It performs a combination of traditional classical music, popular contemporary works and newly composed music.